Does your workload get lighter as the days get shorter and darker? Probably not. Animals still need fed and tended to, work needs to get done, and equipment needs fixed. A well-lit work space is important to ensure that you can work safely and effectively. Task lighting makes work safer and easier, allowing you to see your equipment and workspace. Task lighting can be portable, permanently attached, or you can even wear it. LED lights are one solution for lighting a poorly it area, or upgrading older, expensive to use lights. Task lighting is the lighting available in a workspace, or the area where a task will be performed. Poor lighting, such as only overhead lights, can cause shadows, and make work more difficult and dangerous by hiding sharp edges and other hazards. Inadequate lighting can cause eyestrain, blurred vision, dry and burning eyes, and headaches. Adding task lighting to the dairy parlor. LED lights are available in Edison base (screw in), spotlights, floodlights, linear tubes or light strips. LEDs come on instantly, and are excellent for task lighting. LEDs last for years, and become brighter in cold temperatures, making them ideal for use outdoors, in barns, or cold storage. LED Headlamps are ideal for wearing when you need a light, but don’t want to use a flashlight. The headset has elastic bands that allow you to wear it on your head, and the light beam is directed at whatever you are looking at, which makes it ideal for working on equipment, walking the dog at night, or walking/running outside after dark. 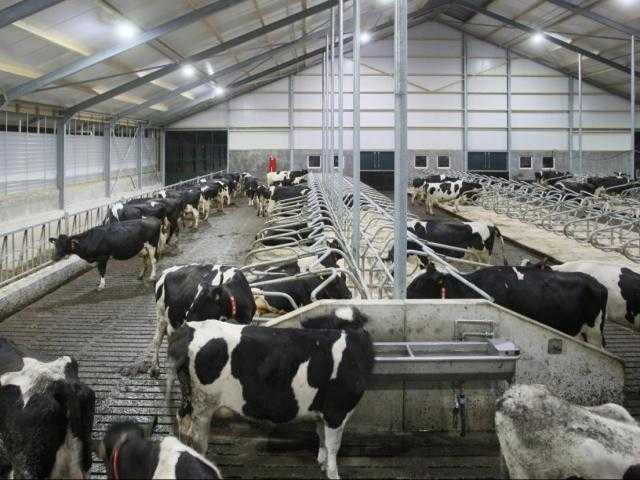 One example of LED lights improving a worksite is how Ohio AgrAbility used LED lighting in the milking parlor and barn of a dairy farmer who had lost some of his vision due to Diabetes. He had a severely restricted field of vision, he couldn’t tell the difference between similar colors, and was rendered nearly blind by changes in light intensity. Before LED lights were installed, it was difficult for him to work with the cows, and he had to depend on his employees to do the bulk of the work. 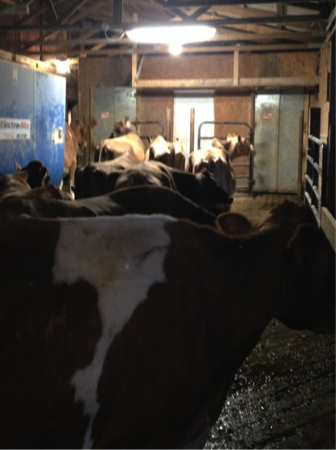 After LED lights were installed, the farmer was able to resume working, he could inspect the cows to be sure they were healthy, and could safely move throughout the barns and his property. 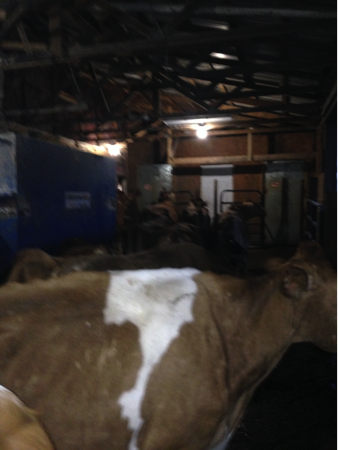 Before LED lights were installed in the dairy barn.